Location: Morrisonville, New York, U.S.A. The Clinton County Sanitary Landfill covers almost 70 acres and receives approximately 175,000 metric tons of waste each year. 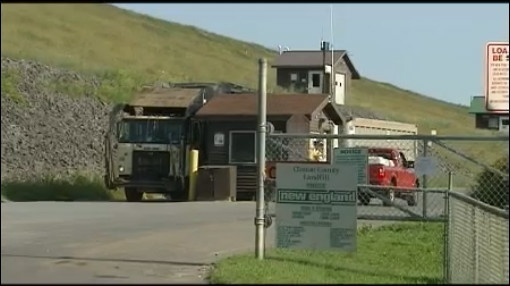 To reduce the greenhouse gas pollution from this waste, New England Waste Services of New York (NEWS), the landfill operators, voluntarily built a landfill methane gas collection and destruction system. The system includes vertical and horizontal gas wells, collection laterals, a blower, and a flare to combust the gas. In April 2005, NEWS began voluntarily flaring the landfill gas. In 2008, NEWS constructed a 4.8 MW landfill gas-to-energy power plant that combusts all of the gas in reciprocating engines to generate power for the local community. This power project became operational in October 2008, and it is expected to eliminate methane emissions equivalent to 100,000 metric tons of CO2/year. This action is comparable to the climate benefits of reducing more than 223,000,000 auto miles per year. This project is a collaborative effort between NEWS, which owns and operates the landfill’s waste-to-energy generation; Clinton County, which owns the landfill; and NativeEnergy, which has contracted to purchase the verified carbon offsets associated with certain methane emission reductions from the project. Municipal solid waste landfills are the second largest source of human-related methane emissions in the United States, accounting for approximately 23 percent of these emissions in 2007. This project, in addition to producing renewable electricity, traps and destroys greenhouse gases otherwise emitted from the landfill. Additionally, the project provides good economic use of otherwise unusable land by transforming what was once considered waste into consumable energy. Revenues from the project’s sales are shared between Clinton County and the project’s operator, NEWS. The Clinton County Landfill project will be listed with and verified to the Climate Action Reserve standard, and its VERs will be retired in the Climate Reserve Registry. The Clinton County Landfill project demonstrates financial additionality according to UNFCCC definitions. The opportunity to realize revenues from the offset/REC sales was necessary to Casella’s determination and ability to implement the project. This project has been validated to the landfill gas protocol of the Climate Action Reserve, and its CRT production will be third-party verified annually.